Released in the summer of 2016, "You Are the One" represents the highest level of craftsmanship in jewelry-making in PoD's history. It combines our expertise in silver-work and the great innovation in gemstone processing that makes it possible for us to unveil this first product of the Twinkling Heart collection. Twinkling Heart® is a revolutionary, patented design that allows the gemstone to move continuously. Once in motion, the vibrant central stone dances with mesmerizing light and twinkles with your movement; and a brilliant cut makes it reflect light from every angle and catch people's eye almost instantly. 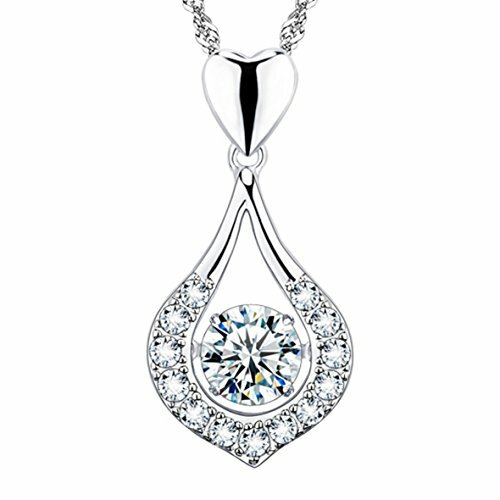 The central stone is set in a pendant that contains a heart and a hanging "water drop". The drop is accented with 13 smaller diamonds along its outline, and decorated with a wave pattern on both sides. The look of the necklace delivers a clear message of deep love - "You Are the One", whom my soul truly loves. The chain of the necklace is a ripple chain, 18'' long, perfect length for showing off a V-neck and to highlight the face. It is also durable and long lasting, and won't break when a baby pulls on it. You'll love how it looks and love how it feels laying beautifully on the neck. Add the necklace to your cart now. The moment she puts it on, she'll feel like the Belle of the Ball on her wedding day.With Twinkling Heart® technology, the central stone moves. It twinkles with motion, and faces forward by gravity even when tilted. Pendant and chain both are sterling silver, plated with rhodium (a member of the platinum group).